Assuming that no white knight (aka NJ Gov. Christie) enters the scene for the Republicans, this fall will be a race between Mitt & “O”. I’ve listened to them discuss their views on a hot button of mine, Social Security. Not surprisingly, both sides have dodged this issue. They say we need adjustments and refer to the “need” to extend the retirement age. They also agree that some adjustments in the Cost-Of-Living (COLA) should be considered. Extending the retirement and COLAs would be implemented over twenty years they claim. These are “kick the can” (far) down the road strategies. Those who are under 50 today would feel the consequences. You can’t blame the politicians for wanting to duck this issue. There is a monster block of voters (primarily the Boomers) who would love to see a plan for SS that pushed things out by fifteen years. If SS became a real topic in the election, it could potentially throw the vote one way, or the other. The fact is, the next president will be forced to make major changes at Social Security. Ironically, the Social Security Trust Fund might be responsible for tossing SS into the political debate. 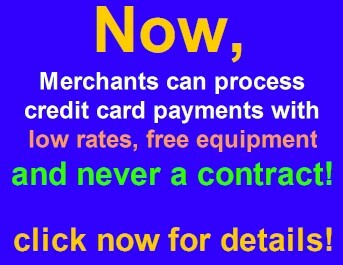 An answer can be found in the 2011 Social Security report to Congress. 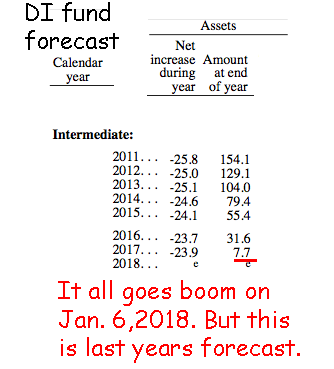 Ten months ago it said that the DI fund would be exhausted in 2018. This very convenient forecast put the day of reckoning for DI two years outside of the next presidential cycle. 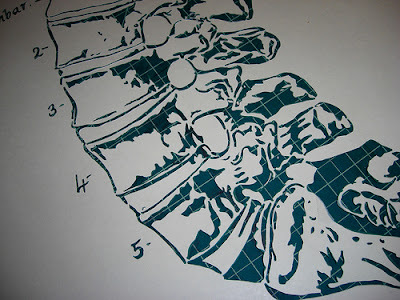 The next question is, “What’s the SSTF going to say in May 2012 about the new termination date for DI?” The answer depends on whether the folks who write the report for SS have “spine”. If they do, they will say that the Base Case for the DI fund shows it will be exhausted in the fourth quarter of 2016. That would mean that DI benefits would have to be immediately and significantly cut across the board. Those cuts would happen on or about Election Day, 2016. If the SSTF produces a forecast that puts the death of DI in the 2013-16 cycle, then it is fair game to force the 2012 candidates to put forward their plans for fixing it. The SSTF will probably produce that forecast. If it does, it opens a Pandora’s box on the very big issue of what to do with the (much, much larger) Old Age side of the equation. The first Q 2012 data for the DI funds shows a 7% YoY rise in benefits. This is largely a consequence of the 3.6% COLA increase. (Ben B. maintains this does not exist). The other 3.5% reflects the rising number of folks getting benefits. Tax revenues are behind “schedule” (blame the economy). Finally, interest income is going to be under “budget”. The amount of investable funds is rapidly declining, and interest income on the DITF’s remaining cash is falling with Bernanke’s endless ZIRP. The 2012 number for the DITF will have to be reduced from last year’s estimates by about $5b. This has a multiplier effect, as the COLA re-base repeats itself with every year. The revision for 2012 will add up to more than $20b over the next four years. This minor adjustment will bring the termination date to June of 2017. It’s still not close enough to bring the issue onto the 2012 political table. But more adjustments are in order. The SSTF is stuck with a downbeat economic forecast from the CBO. It can’t have a rosy forecast when its “buds” up the street are saying it isn’t so. Adjusting to the CBO’s dour outlook will knock another seven months off the life of DI. A) The DI fund will be exhausted in 2017. This is the spineless approach as the details will show that the actual date of exhaustion is January of 2017. B) The DI fund will be exhausted in the 4th quarter of 2016. That would be “show time”. Unless there are changes to the program, the deficits at DI will continue to grow. The long-term, unfunded cost is 0.4 – 0.5% of GDP. That would put the cost of maintaining DI at about 10% of the military, and 5% of the cost for both Medicare and Old Age SS. In the scheme of things, the problems at DI are small. Other problems are so large in comparison. But a “fix” at DI could add another half-trillion onto the debt/deficit in the decade after it goes broke. That’s not a small number at all. If Obama is honest, he will acknowledge the problem and propose new taxes to fill the bucket. He will say that America is too rich a country to let disabled workers fall through a crack. He will get votes for that position. Romney has a problem. He can’t propose higher taxes that would be earmarked to stabilize DI. He will say that DI has to be cut to the point that it becomes Pay-Go without new taxes. He will get votes for that position, but it will expose him to criticism. It will be argued that this is about the 1% versus disabled workers. Obama would have a field day with that position. “O” would be protecting the widows and orphans while Mitt would be keeping the rich, rich. There must be a fix at DI in the next four years. The next president will guide that resolution through Congress. The “fix” will either socialize the system by diverting tax dollars to it, or the program will be starved. The solution will be a cookie-cutter preliminary version of the much bigger issue of the Retirement Fund. OASI will face a much larger wall in 2017 – 20. What will happen to DI in 2016 will pave the way for what happens to OASI in 2019. One final chart. 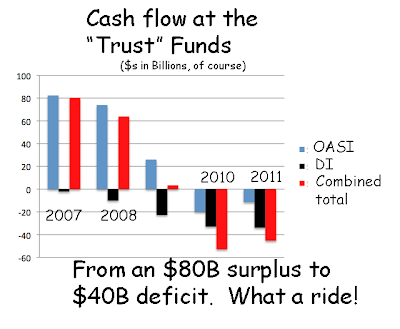 This looks at cash flow for DI, OASI and combined SS. 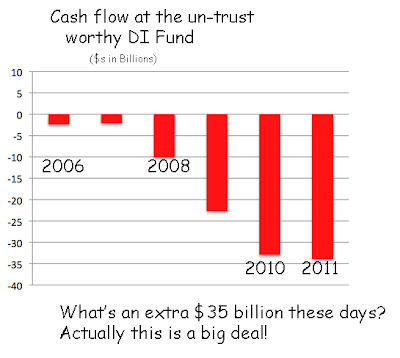 We crossed the red-ink line on DI in 2005. OASI went into the red in 2010. Neither fund will ever be in the black again. Both candidates may try to point to fraud and abuse at DI as the problem. There is abuse, lots of it. But if it ended tomorrow, it would not move the needle. The required fix is much larger than the abuse. Neither candidate wants SS to be an issue. If it becomes one, Obama has more to win and Romney more to lose.